This piece is a companion to the Dean-O-Files podcast #37, published 4/25. It can be found on Alternative Internet Radio. 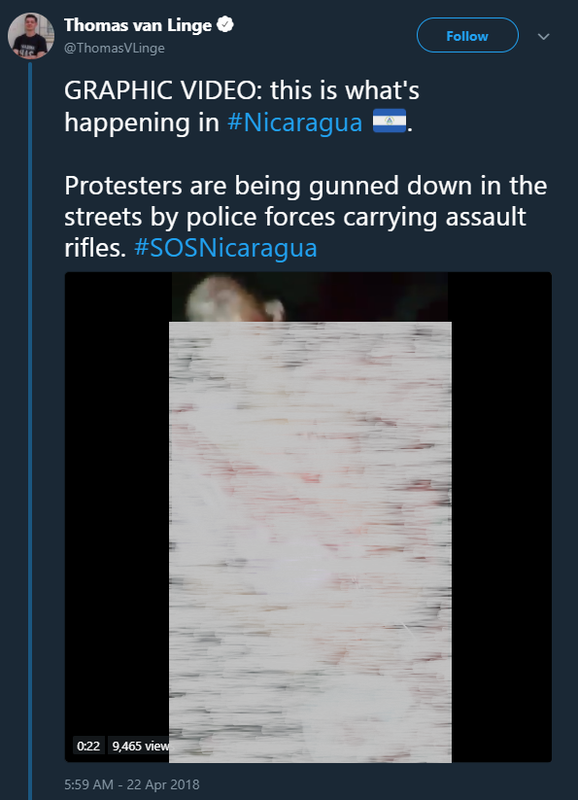 Most of you are probably aware of what has been happening in Nicaragua over the last week. Following announced Social Security reforms that increased the amount that Nicaraguans paid in and decreased the amount they could draw out of the program, pensioners and students took to the streets to protest. Soon after, the protests turned violent. Police began dispersing crowds with rubber bullets and gas, and the government began censoring television and radio stations. This is not abnormal for an autocratic regime like Ortega’s, but what frightens me are the actions of pro-government groups amid the chaos. Sandinista Youth student groups attacked protesters and members of the press, stealing cameras, threatening, and beating them with bludgeoning weapons. The police did not step in to stop the violent socialists and, in some cases, it was reported that the attackers were, in fact, operating with police protection. Right. Let’s take a very short tour through the history of Ortega’s regime. Carlos Fonseca, a Nicaraguan revolutionary, founded the Sandinista National Liberation Front (FSLN) in 1961. They took power in 1979—stuff happened in between, but this is a very short tour—and, in late 1981, the Reagan administration began supporting anti-Sandinista rebel groups called Contras. That should sound familiar to you. In 1984, Daniel Ortega was elected president in a general election that has been deemed to have been free and fair, except maybe it wasn't. The Sandinistas later lost three elections, in 1990, 1996, and 2001, but things happened and the 2006 elections resulted in victory for the “quasi-communist” Ortega, who was re-elected in 2011 and, after a change to the constitution, again in 2016. He has been called a “rising dictator” of sorts, and I tend to agree with this assessment, which is why I called him an autocrat. In this most recent upheaval, the police are alleged to have fired on protesters—using lethal force at point-blank range—and stolen supplies and food from people there to support the protesters. It has also been reported that they withheld medical support from those who needed it by blocking first responders who would have assisted wounded protesters. The Sandinista Youth are alleged to have killed, beaten, and threatened journalists and protesters, with police refusing to step in. Evidence of these are below but, sadly, because the news media is not digging in to this as much as they could—or should—be, I’m stuck trying to pick out the tweets in #SOSNicaragua that appear to be legitimate for evidence of the above. Ortega’s government has reversed the Social Security reforms and the protests have shifted gears to marches against the government and police violence and vigils for the dead. The public is outraged now. The violence has not stopped, but the tide seems to be ebbing, if only for a moment. If the public continues to protest the way they have been treated by this government and their police, the violence will likely continue. 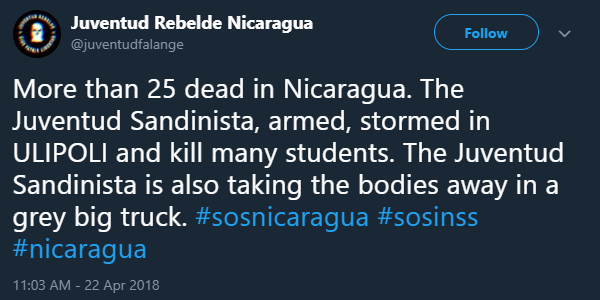 I recommend keeping an eye on the #SOSNicaragua hashtag to stay abreast of the issue. The numbers of wounded and dead may never be truly known, but, at the time of writing, some estimates I’ve seen place them over 120 and over 30, respectively. The number of missing is unknown, but, from what I’ve seen, must be at least as high as those wounded. Probably more. This is based on reports that are, by this time, a couple of days old. I don’t know what comes next for Nicaragua. I don’t know if, after the protests have subsided, the people there will demand a new government, a new system. There are anti-communists there, but I don’t know how many and I don’t know how how strong they are. I don’t know if this is a revolution, or simply a protest against the loss of a small percentage of a government system I am philosophically opposed to in the first place. I don’t know what the people will do, now that they know just how powerful they are, and how frightened their government is of them. All I can say is that I support the struggle of any people against the oppressive, violent censors who would purport to rule them. I’ll be keeping an eye on this. You should too.